The Brewers have bad news about their closer but good news about their starting rotation. Meanwhile, Pete Alonso is "a near lock" and Miguel Cabrera a source of optimism. The Brewers are making all the headlines heading into the biggest draft weekend of the year. First, the bad news: Corey Knebel may need Tommy John surgery. That's not how the Brewers are presenting it, of course, saying nothing is definitive until he gets a second opinion. They're not even sure how to describe the injury, other than to point out it's not a complete tear of the UCL. "We're still determining the extent and whether to officially call it fraying/tear/etc," president of baseball operations David Stearns said. "But we know it's damaged to some extent." Regardless, damage to the UCL is a precarious thing that's often worth correcting through surgery just so more time isn't wasted through failed rehabilitation efforts, which can take months in their own right. The one reason for optimism in Knebel's case is that the damage may not be new. "Corey has pitched with this for a long time, so we've got to figure out what's there, what's new," manager Craig Counsell said. "We're going to make sure we get the right answer and then move forward." Then again, the drop in velocity that prompted this exam in the first place was indeed new. Until we know, Knebel is radioactive in drafts because we have to assume the worst. The Brewers are putting on a brave face, but they're speaking with long faces. And normally by the time the words "UCL damage" reach the media, it's all but a sure thing. Which of course means someone else would have to close for them. It may well be free agent Craig Kimbrel, who the Brewers engaged recently, possibly because of what they already knew about Knebel. Failing that, Jeremy Jeffress has certainly proven capable in the role, but he's also ticketed for the IL at the start of the year with a not-so-serious shoulder issue. So in the meantime, it's ... Junior Guerra? Matt Albers? Jacob Barnes? Of course, Josh Hader will be in play as well, but Counsell has in the past been fiercely opposed to confining the lefty to ninth-inning duties. Still, he might get a nice little bump in saves while the Brewers await Jeffress' return ... or Kimbrel's arrival. Or hey, maybe Knebel's recovery. As of now, it's anybody's guess. But wait, there's also good news from the land of beer and cheese. Counsell announced the team's starting five for start of the season, and it's like a Fantasy owner's dream. Not only did trendy SPARPs Brandon Woodruff and Corbin Burnes make it, as was the hope once we learned Jimmy Nelson would begin on the IL, but so did Freddy Peralta, an even younger pitcher (22) with probably the most strikeout potential of any of them. "It's time for them to start," Counsell said. "That's the decision that we made, that we're going to put them in the rotation." How refreshing to see a team go the all-upside route from the get-go instead of slipping through the back door midseason. They had options, you know, but they allowed control artist Josh Tomlin, formerly of the Indians, to walk rather than commit a major-league job to him and opted to send veteran Chase Anderson, a presumed rotation fixture, to the bullpen for now. In terms of Fantasy impact, I rank the three young arms Woodruff, Burnes and Peralta. Woodruff's stuff might actually play better in the rotation than the bullpen. When he's incorporating all five of his pitches, as he did in September and the playoffs last year, his four-seamer becomes a weapon in its own right, and he can obviously make better use of that full arsenal over multiple innings. Burnes boasts a starter's arsenal as well, and prior to a stint at Colorado Springs last year — which is sort of like the Coors Field of the minors — he had an ERA around 2.00 for his minor-league career. Whether he'll get the whiffs of the other two remains to be seen, but he controls the strike zone and presents a low-risk investment. Peralta is sort of the opposite end of the spectrum. He features basically two pitches, throwing his fastball 80 percent of the time. But he hides it well and has been known to vary the speed on it, making it a stunningly effective pitch. He's the most likely of the three to get bumped when Nelson is ready to return since he's erratic and could stand to spend more time fleshing out his arsenal, but let's not forget he struck out 13 in his major-league debut last year and averaged 11.0 K/9 across 16 appearances, 14 of them starts. Clearly, there's sleeper appeal for all three — the kind that didn't exist for Anderson and, quite frankly, doesn't for Jhoulys Chacin and Zach Davies, the other two members of the starting rotation, either. Headline kind of says it all. In a piece speculating how the Mets might divide playing time between Pete Alonso and Dominic Smith at first base (hint: not a lefty-righty platoon), beat writer Anthony DiComo of MLB.com described Alonso as "a near-lock" to make the roster. Apparently, new GM Brodie Van Wagenen was serious about not playing service-time games. Of course, Smith presents a new concern, but I don't think a serious one. The Mets have already turned the page, practically speaking. Smith put in some work this offseason and has turned in respectable numbers this spring, but respectable is all they are. For all the generous headlines, only three of his hits have gone for extra bases. Meanwhile, he has struck out 27.6 percent of the time, which won't fly if he also doesn't hit for power. The rub on him even during his glory days in the minors was that he might not. Alonso is an 80-grade power bat who draws walks and is proving capable against major-league pitching. Smith is the desperate clinger hoping to to secure a bench spot. When a stud prospect with a claim to a big-league job falls in your lap in Round 19, lap it up, I say. Andrew McCutchen will be the #Phillies leadoff hitter on Opening Day. They like his combination of on-base skills and power. Cesar Hernandez likely to hit sixth or seventh. And if there wasn't already hope for an Andrew McCutchen bounce-back in his first full season in a hitter-friendly park, there is now. One thing he has continued to do well even during his decline phase is get on base, doing so at a .368 clip last year. 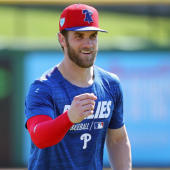 The difference now is he'll be doing it more often and in front of Bryce Harper, Rhys Hoskins and J.T. Realmuto. Barring injury, there's a chance McCutchen scores 100 runs for just the second time in his career. Not even during his MVP 2013 season did he pull off that feat. But the venue change is even more significant. It wasn't just that he wasn't playing in a place like Philadelphia before. It was that he was playing in two of the most stifling parks for power hitters, Pittsburgh and San Francisco, and yet still manage to reach the 20-homer plateau. He still has some speed, having swiped 14 bases last year, and doesn't do anything especially wrong offensively. These two changes — the park and lineup spot — should allow him to do it in higher quantities this year, perhaps even challenging George Springer's spot in the rankings. So you haven't warmed up to the idea of drafting Miguel Cabrera yet. It's no surprise. He's a soon-to-be 36-year-old who's coming off biceps surgery and hit .249 with 16 homers during his last "healthy" season two years ago. Bottom line is it looks like there's still plenty in the bat if the Tigers can just keep him healthy, and the availability of the DH spot this year should help with that. I'm not as excited about drafting Cabrera as I am Alonso or Luke Voit, but he's in a similar spot on the risk-reward spectrum. Kyle Wright turned in his first bad performance Thursday at the Rays, but it was so bad that it elevated his spring ERA to 7.11. No matter. It sounds like he has a spot in the Braves' starting five regardless. And to hear David O'Brien of The Athletic tell it, so do Touki Toussaint and Max Fried. Pretty good. You might remember he struck out 11 over 6 2/3 innings in a spot start against the Cardinals last June, and that's how effective he can be when his curveball is on. The problem is finding consistency with it. His stay in the rotation might be the most short-lived of the three since it's tied to Kevin Gausman building back up from a shoulder injury, but then again, the Braves will probably treat the first few weeks of the regular season like a continued audition for Toussaint, Wright and Fried. Who's to say the 25-year-old lefty won't pull away from the other two?